This is going to be the best $1500 PC build that you can buy right now. We’ve spent over 25 hours on researching the best parts for this build. You don’t have to waste any of your own time researching and trying to understand various technical aspects and compatibility issues. Let us dive right into the build now! If you want to save $500 and opt for a $1000 gaming PC, then check out our very own $1000 gaming PC build! Yet, while we expected, and delivered, greatness, we still had to cut some corners to make sure everything fitted into the budget. And throughout the entire process of research, mixing-and-matching, and writing, there’s one sentiment that we repeated countless times: if only we had at least 100 more dollars. Well, now we get to live out that fantasy and then some, with a whopping $1500 in our budget. 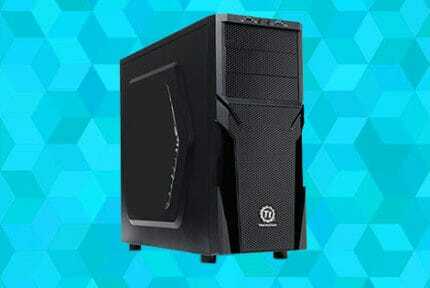 So if this is the kind of cash you’re working with, then look no further, because what you’re about to see is the ultimate gaming PC under $1500 for 2019. 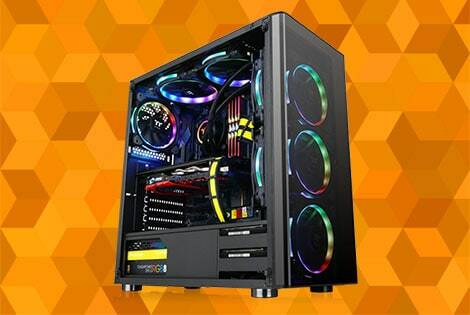 Perhaps you’d like to go even higher and build the ultimate gaming PC? Here’s our build guide on the best $2000 gaming PC! But for now, let’s take a closer look at each component and see what the best $1500 PC build contains of! Just to make sure we’re all on the same page, we will briefly go through the list of things you can expect from this gaming PC rig. First and foremost, there’s the actual in-game performance. For this kind of cash, you shouldn’t settle for anything short of extraordinary, so we’ve made sure that this PC is ready to take you into the realm of 4K gaming, and with excellent frame rates to boot. You shouldn’t expect fewer than 30 FPS in 4K in most games. And we say this only to account for the most demanding and poorly optimized titles out there. All in all, you’ll be getting around 45 FPS in 4K in most AAA titles, with the graphics maxed out. Play with the options a bit, drag some sliders to the left, and you may very well be playing new AAA titles at a stable 60 FPS. Another thing worthy of note is that this PC is more than capable of tackling VR and Streaming. We’ll talk more about VR in the CPU section, but both the processor and the graphics card in this build are capable of running VR and making it look great. And as for Streaming, seeing as you won’t be streaming in 4K, you won’t have to scale down any graphics sliders for this. And lastly, while we don’t think this PC will get obsolete any time soon, we still didn’t feel like locking you into some non-upgradeable hardware, a sentiment that you’ll find reflected in our choice of the motherboard and CPU, although more on those when we go through each of the individual pieces of hardware. So, without any further ado, let’s begin. The following are the components we’ve personally hand-picked to make this the best $1500 gaming PC you could get right now. If your budget is a bit lower, check out our $1000 PC build guide! And what better way to kick things off than by highlighting the AMD Ryzen 7 2700X. This 2nd Gen Ryzen CPU is an absolute beast. With a base clock speed of 3.75GHz and a boost clock speed of 4.3GHz, this processor is sure not to leave anyone wanting. And the speed isn’t even the main attraction. What truly makes this CPU shine brighter than the competition is the fact that all 8 cores are multithreaded, meaning that you have access to as many as 16 logical cores. Now you may be thinking: Do I really need 16 cores for gaming? Truthfully, no; no you do not. For regular gaming, that is. But if you have your sights set on VR, this is the CPU that will ensure you have the best possible experience. If you want to stream, or do pretty much anything in the background while your game is running, this CPU will have you covered. And let’s not forget future-proofing. While some other, less powerful CPUs would still be sufficient for this gaming rig, they would start bottlenecking the moment you upgraded to a more powerful GPU than the one we have listed. Granted, the GPU we’ve listed won’t be getting outdated any time soon, but that doesn’t mean you might not raise your gaming aspirations even higher. When that happens, you’ll be sure to appreciate having such a powerhouse CPU that’ll still be eligible for overclocking. 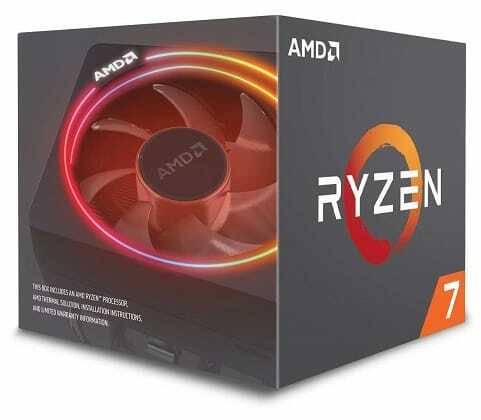 So whether you’re dead set on VR, curious about it or not in the least bit interesting, we still feel that the Ryzen 7 2700X is objectively the best CPU to get for this budget. And if you weren’t sold on the CPU already, get ready for this. The thing that bumps up the value of the Ryzen 7 2700X even further is the fact that it comes with its own stock cooler. Now, as we’ve said, this is a beast of a processor. Intel doesn’t even include a stock cooler with their overclockable CPUs, so is this just a gimmick or a good enough cooler to handle all this power? Fortunately, it’s the latter. In fact, the stock Wraith Prism cooler is actually powerful enough to keep the CPU cool even after some light overclocking; not that you’ll need to overclock this processor for gaming in the first place. And as the name implies, this cooler comes with some sick RGB lighting that you can customize to your liking. If you’ve been at all skeptical about keeping the stock cooler, trust us, it won’t disappoint. It’s a win on all fronts: price (or lack thereof), performance, and good looks to boot. The new RTX graphics cards are finally here. Granted, their maximum potential could be called somewhat dubious, simply because there are, as of yet, no real RTX games, so we can’t measure how much the real-time ray tracing will contribute to improving the overall gaming experience. That said, however, these new GPUs still manage to easily outperform what the last gen had to offer and it can only get better from here, so there’s no way we couldn’t include one in our build. 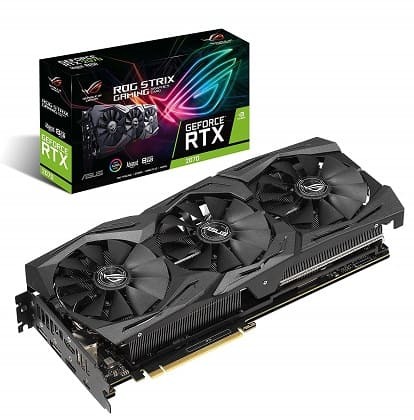 Especially seeing as we’ve had room in the budget for not just any RTX 2070, but the RoG Strix RTX 2070 A8G Gaming. This triple fan beast of a graphics card won’t leave even the most performance-hungry users wanting, easily able to push a stable 30 FPS in 4K with absolutely all settings cranked up to eleven. And this is in some high-demanding but very poorly optimized titles, like Assassin’s Creed Odyssey. In most games, the framerate is much closer to 60 FPS than it is to 30 FPS, and we could even see it reaching a stable 60 FPS in most games with just a bit of tinkering in the graphics menu. And that’s if you don’t overclock this card, which it’s more than equipped to handle, what with the three Axial-Tech Fans and the Max-Contact Technology that doubles the contact surface between the heatsink and the GPU. And of course, this being a Republic of Gamers graphics card, it comes with the amazing AURA Sync RGB lighting that, coupled with the Wraith Prism Cooler, truly makes this PC as awesome looking as it deserves to be. Now we know what you’re probably thinking: That’s great and all, but why not an RTX 2080? This is a lot of money I’m investing, why should I settle for a mere RTX 2070? Firstly, it can’t fit into the budget. And secondly, (and this may be more important) you’d be very wrong if you were comparing this GPU to the GTX 1070 because it actually performs better than the last-gen GTX 1080! And if we had a GTX 1080 slapped on here, we’re sure we’d be raising fewer eyebrows right now, but then again, this is why you’re here. We do the research and you reap the benefits. We actually tried to make a build that places an RTX 2080 as its number one priority. We did succeed, but we don’t think the end result was worth it. The cheapest RTX 2080 model currently available is the $800 EVGA XC Gaming. And it was only after reducing the case to a lightweight monstrosity that would all but rattle with the GPUs power, the PSU to a ticking time bomb, the CPU to a respectable Ryzen 5 2600X, and the storage to barely include any SSD, that we managed to do it. 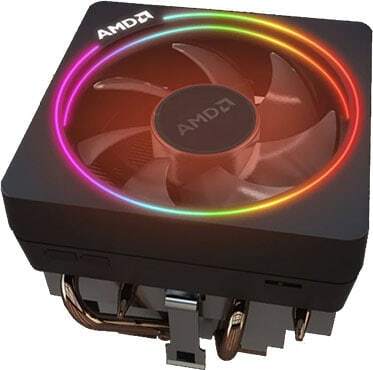 The good thing is that, should you want to forgo VR entirely, you could very well rely on the Ryzen 5 2600X to mostly keep up with the EVGA RTX 2080 XC Gaming, but we’d suggest including an extra $100 in this build, just to make sure the PSU won’t end up frying anything, and that the case at least has enough weight not to rattle like a washing machine. If there was one thing we wish we could’ve bumped up in the previous build the most, it has to be the RAM capacity. 8 GB of RAM is sufficient for gaming, but just barely. At the moments, most games don’t require more than around 7 GB of active RAM use, but given that background, processes will also eat away at your stores of memory, 16 GB of RAM is the ideal amount here. Any more would be wasted for gaming, but any fewer would make the PC struggle a bit. And for this build, we’ve singled out the Corsair Vengeance LPX memory sticks, a reliable brand with a proven track record. As always, we strongly feel that opting for the dual channel variant is much wiser, simply because you’ll still be able to operate your PC, even game, should one of the paired up 8GB sticks die. Alternatively, if your single 16GB stick gives out, that’s it, have fun living an analog life until you replace it. Additionally, we’ve also bumped the memory speed up to 3000MHz. This isn’t a huge deal, but given that we had a couple of extra dollars at the end, we figured that this would be the best place to invest them in, just to bring the FPS up by a few frames. Lastly, we’d like to mention that you can safely treat the RAM as maxed out and not needing any upgrades. Not even if you were using an RTX 2080 Ti. Games just don’t need that much RAM, and it’s more likely than not that DDR4 will get outdated before 16 GB of RAM stops being sufficient. And the part that’s going to be keeping all of these different pieces of hardware together and feeding them power is the Gigabyte X470 Aorus Ultra Gaming motherboard. It may not be the most high-end solution, but it’s one that has everything you’ll need as a gamer, and even then some, with the inclusion of some nice RGB lighting with a dedicated LED light for true white colors. 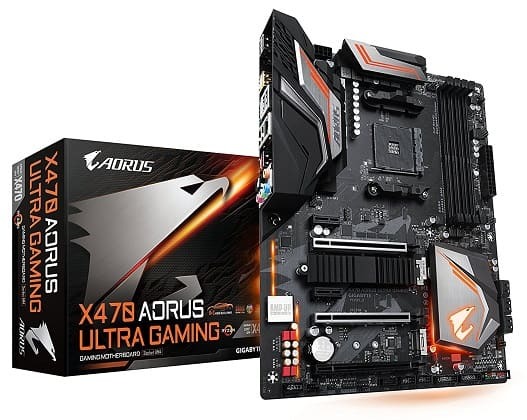 Like all X470 motherboards, the Aorus Ultra Gaming was fine-tuned to get the most out of the 2nd Gen Ryzen processors, and you aren’t likely to find a better match to go with the Ryzen 7 2700X. But it also offers some excellent future-proofing upgrade paths, like the Dual Ultra-Fast M2s with a Thermal Guarded NVMe PCIe X4. If you don’t know what this means, it basically means that you have access to the fastest storage devices yet, far eclipsing even the normal SATA 3 SSDs. You’re covered RAM-wise as well, should you want to expand. The X470 Aorus Ultra Gaming maxes out at 64 GB of RAM, with the maximum speed of 3200MHz. The motherboard even supports SLI and CrossFire multi-GPU technologies. Full disclosure though, the RTX 2070 GPU doesn’t support SLI. Nevertheless, it’s one of the many upgrade paths you’ll have available. And we haven’t even mentioned the best part yet! You can purchase the X470 Aorus Ultra Gaming and the Ryzen 7 2700X bundled together on Amazon, driving the price even lower. Unfortunately, despite the motherboard offering NVMe support, we just couldn’t squeeze it into the budget without seriously hurting the volume of the storage. But that doesn’t mean that we still couldn’t make the most out of the situation. 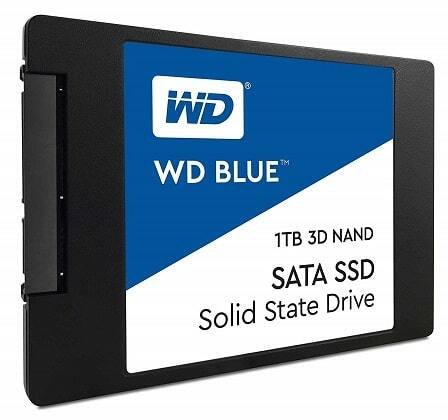 That’s why we’ve once again opted for the tried and true WD Blue 3D NAND with 1 TB of SATA 3 SSD storage. At the moment, the SATA 3 is still the best performing storage, just behind NVMe, so you won’t be sacrificing all that much. In fact, if you’ve never experienced the joy of using an SSD in the first place, you’ll probably be wondering how it is that any type of storage could be faster than this. There have been cases of the motherboard not automatically detecting the storage as NVMe and instead treating it as a regular SATA 3, which technically cut the speed by three quarters, but casual users didn’t notice this just because the SATA 3 is so fast in the first place. And seeing how the only benefit of storage speed in gaming is to reduce load times, we figured it’s best to increase to the volume by opting for a 1 TB SSD solution than to just prioritize speed. 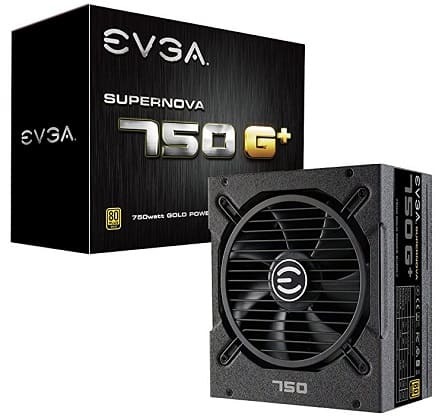 The more that we looked at all the available PSUs at the price range we were going for, the more we kept falling in love with the EVGA SuperNova G1+. There simply isn’t anything about this PSU that’s short of amazing. The build quality is immaculate, from the materials used to the 135mm Fluid Dynamic Fan, just as you’d expect of one of the best PSU manufacturers out there. So much so that it comes with a 10-year warranty. You can even get two extra years added to the warranty if you order it on Amazon before January 2019. On top of that, it’s certified 80+ Gold. This means that it’s one of the more efficient models, drawing less power and generating less heat. And with 750 watts, it’s powerful enough to get this high-end gaming rig going and then some, leaving you with room for upgrades without needing to get a more powerful PSU. And the best thing is: this is a fully modular PSU, meaning that you won’t have to suffer any unnecessary cable clutter. And lastly, there’s the case. If you’re already buying a gaming rig as high-end as this one, it would be a damn shame not to put it in an appropriately awesome case, so we’ve spared no expenses here, opting for the Thermaltake V200. Now you’ve probably guessed as much just by looking at the picture, but this case is truly something. Not only does it look absolutely amazing, but it can facilitate airflow in a way that not many computer cases in this price range can. 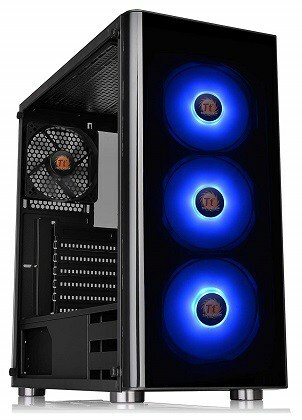 It does so thanks to the three front RGB-lit fans and one exhaust fan on the back. Additionally, you can mount up to two more fans on the top of the case. For this, you can either use some of the front fans or buy new ones, bringing the total up to six! All the 120mm front fans feature RGB that can be synced to the motherboard, so they’ll never look out of place. The X470 motherboard in this build is, of course, compatible. And in keeping with the RGB gaming aesthetic, the left panel is entirely made of glass – 4mm tempered glass, to be precise. This means that the graphics card, the CPU cooler, and the motherboard all get their chance to shine (literally). 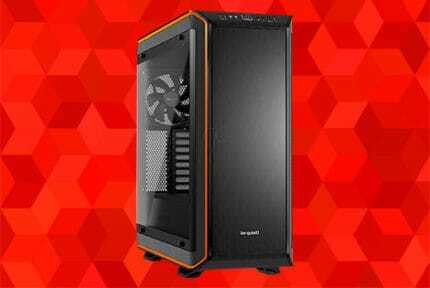 As an added benefit, there’s also a built-in PSU cover, so that all the cables protruding from the PSU won’t take away from the magnificent look of this gaming PC. There’s more we could say about this case, but we’ll leave you with this for now. That about does it for the hardware part of the build i.e. the part that’s covered by the budget. But, unfortunately, as incredible as this PC is, it’s just an impressive, shiny box without any peripherals. It’s great if this gaming rig could inherit some peripherals from your old PC, but just in case, we’ve also listed some of the best peripherals for every category that will complement this PC. Some of them, like the mouse and keyboard, will always come down to preference and we know that there’s no single model we could pick that would be right for absolutely everybody, but others, like the monitor, need to adhere to a certain standard, otherwise they’d just be wasted on a computer this powerful. So with all this in mind, let’s look at the peripherals we’ve picked out that will best suit this $1500 gaming rig. Let’s start with the simplest one: the operating system. Not to sound like a broken record, but if you want the most optimal gaming experience, then there’s really only one choice and that’s Windows. Linux has its merits, but game compatibility isn’t one of them, and neither is it optimization. To put it in the simplest terms, this means that you’ll consistently be getting fewer FPS in Linux than you would in Windows running the exact same game with the same options. Now, Linux does have the benefit of costing you only the time it takes to download and install it, so if this should prove to be the only option then we’d suggest going with one of the versions better suited for gaming, like SteamOS or Game Drift Linux. 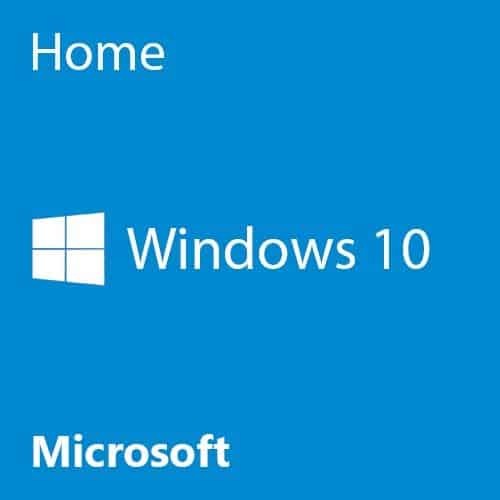 Nevertheless, it feels like settling here would be a huge waste if you’ve already gone and invested $1500 in all the hardware we’ve listed, so we can only recommend Windows here. Now, this is where things get a bit complicated, just because you have access to both higher resolutions and higher refresh rates. Although, it if were just that, it wouldn’t cost almost as much as the graphics cards. 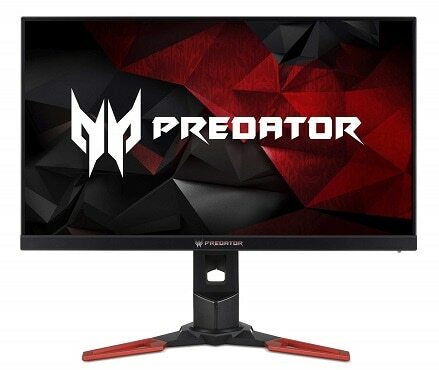 There are two things that make this monitor so much more expensive than some of the ‘budget’ 2K 144Hz models, and these are G-Sync and the IPS panel. G-Sync is Nvidia’s proprietary take on the elimination of screen tearing normally achieved through the V-sync option in the graphics menu, only with the added benefit of being hardware based, meaning that it won’t impact game performance like normal V-sync would. But while this is nice, what we love about this monitor, even more, is the inclusion of an IPS panel. Most high refresh rate monitors use a TN panel. They’re much cheaper and offer much better performance, but this comes at the cost of visual quality. The image on a TN panel display looks bleak and washed out. Getting an IPS monitor up to 144Hz definitely costs more, but the results are simply breath-taking, taking away any and all compromises. Now, if you want a cheaper alternative without the G-sync and with a regular TN panel, then we suggest checking out the 24-inch AOC Agon AG241QX a look. It does have FreeSync, that’s rendered obsolete given that this PC uses an Nvidia graphics card, but FreeSync barely drives up the price of monitors at all, so from a cost-efficiency standpoint, this was easy to ignore in favor of all the other cool features. Alternatively, if you value visuals over performance, you could get a 4K monitor like the 27-inch LG 27UD58-B. The best thing about it is, obviously, the resolution, but it will lock you into 60Hz. Still, if these are your preferences, then this is a monitor that won’t disappoint. The important thing here is to stay true to yourself. If what you want to do is game in 1080p and 200+ FPS, then get an Asus RoG Swift PG258Q and do just that. The possibilities truly are endless with a GPU this powerful behind the monitor, so just shop accordingly and have fun. Ah, the SteelSeries Rival 600, isn’t she a beauty? And it’s fitting that the mouse has ‘Rival‘ in its name because we finally have a mouse that can rival and even surpass the famed Logitech G502 as the best all-purpose mouse on the market. It’s simply gorgeous to look at, with some very stylish customizable RGB lighting and fits perfectly into your hand. The novelty that stands out the most on your first try will definitely be the silicone side grips that will ensure a firm control over the mouse as well as help with the durability. On the technical side of things, this mouse features the TrueMove3+ sensor, marketed as the world’s most advanced sensor system. The basis for this bold claim? Well, it’s actually a dual sensor that incorporates both true 1 to 1 tracking and the bleeding edge lift-off distance detection. So is it really as good as it sounds? Yes; although, if we’re being honest, most casual gamers won’t actually notice the improved lift-off distance detection. If, on the other hand, you’re a competitive gamer, you’ll be sure to appreciate it. What’s more, the Rival 600 features one of the best weighting mechanisms we’ve seen so far, giving you full control of the way that mouse will feel in your hand. The last of many new innovations that we’d like to mention is the placement of the third button on the left side of the mouse. We’ve already seen many attempts at incorporating the third button here, but what we like the most about this vertical button that’s in front of the other two is that you’ll never press it by accident, as you would the ‘sniper‘ button on the G502. If you’re already going to game on a PC this grand, you should do it in style. And no keyboard does style quite like the Corsair K95 PLATINUM while at the same time sacrificing none of the substance. 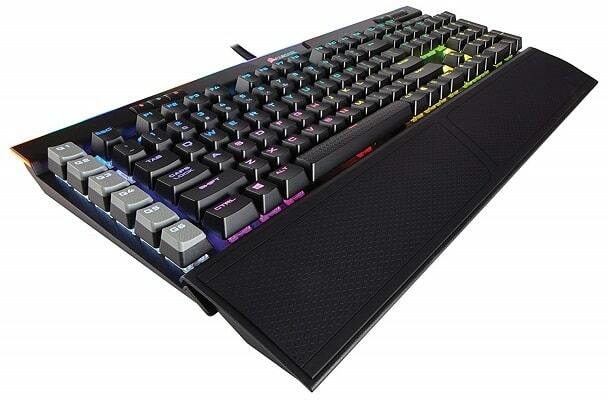 Style-wise, you’re greeted with some of the sickest RGB lighting we’ve ever seen on a keyboard, and it’s fully customizable along with the ability to light up every key differently. Basically, whatever light show you can think of in your head can be done on this keyboard, with just a little know-how. It helps that the Corsair Utility Engine might very well be the best piece of keyboard software out there, with just how user-friendly it is. But even should we omit the RGB for a second, this is still a marvelous keyboard, featuring an aircraft-grade aluminum frame, Cherry MX Brown mechanical key switches, and 6 programmable keys. The coolest features, for us personally, at last, have got to be the volume controls and the detachable wrist rest that, by the way, is dual-sided, so you can adjust it entirely to your liking. It may cost more than most people would think to spend on a keyboard, but this here isn’t just any gaming keyboard, it’s a life partner that will grow old with you and never give out. Just in case we didn’t repeat ourselves enough times, we’ll say it again: this PC can handle the full extent of VR. And there’s no better way to experience VR than by using the HTC Vive headset. It’s not that it’s superior to the Oculus Rift from a technical standpoint; the two are rather evenly matched in this regard. But the Vive has one huge point going in its favor: SteamVR. Now, the Oculus Store isn’t bad, it’s not like it offers much that Steam doesn’t. But we’re willing to bet that everyone looking at this guide already has an expansive Steam library and probably zero titles purchased on the Oculus Store. 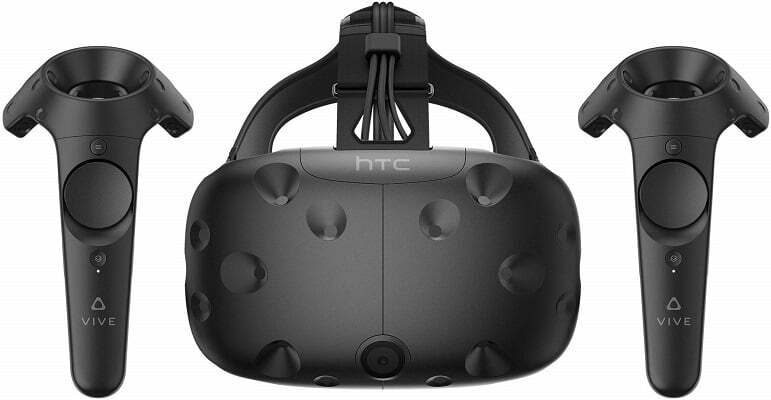 Couple this with the fact that the SteamVR also lets you play certain titles in VR that weren’t developed for it and becomes crystal clear why our pick goes to the HTC Vive. VR or no VR, having the controller has become an absolute necessity for PC gamers in recent years. 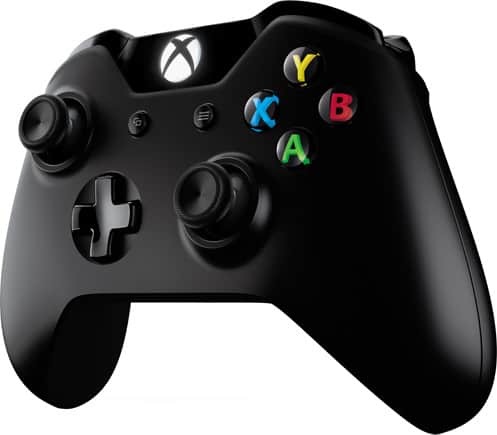 And to help you through all the controller-enabled games, we’ve elected the Xbox One Controller. It offers the perfect mix of comfort and functionality. After all, it’s basically a direct improvement upon everything that the Xbox 360 controller was, and the 360 controller is still hailed as one of the best controllers for PC ever. The hefty size and ergonomic contouring help make the Xbox One controller extremely comfortable, while the responsive triggers with integrated rumble make it an absolute joy to use in shooters and racing games. You’ll still prefer the DualShock 4 should the games you prefer be heavily D-Pad oriented, but given how this pretty much boils down to just fighting games and platformers, we feel that the Xbox One controller offers greater versatility and can, therefore, recommend it to all but the most specialized gamers. Not to mention that the plug-and-play Windows compatibility will save you a headache or two. The reason we didn’t highlight something more ‘high-end’ here, like the Xbox One Elite Controller, is because games that were made for controllers were made with the basic button number and layout in mind, so while the extra buttons are nice, they’re unnecessary in most cases. As always, though, preference is all that matters, so if you don’t think the Xbox Box One Controller suits you, here‘s a good place to start looking for alternatives. Having a good headset is oftentimes more important to a gamer than having good speakers, and we’ve spared no expenses here with the HyperX Cloud Revolver S.
This headset has everything a gamer could need: excellent durability, great sound quality, and extensive compatibility. Durability – the tough steel frame is there to ensure that this headset won’t break from simple fear of heights. 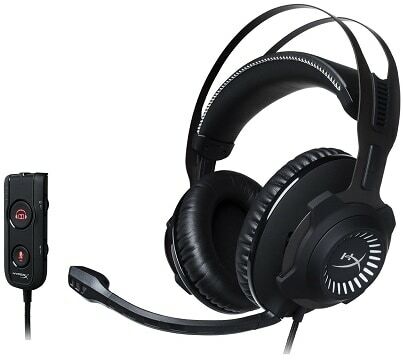 Compatibility – it isn’t often that you come across a headset that’s compatible with the PS4 and the Xbox One, as well as PC, so you’ll be covered should you ever feel the need to play some great console exclusives. Additionally, check out this guide for the best wireless headsets, if that’s more to your liking or this one for the best budget solution, in case you won’t be using the headset as your primary audio device. 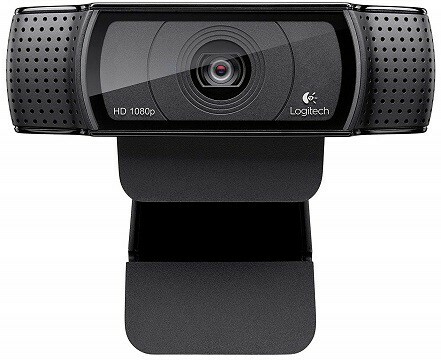 And for those of you who plan on streaming, the Logitech HD Pro C920 still remains the best and most cost-efficient webcam to get. Its specs blow the competition entirely out of the park, what with the 15 Mpix camera and the 1080p resolution, and the technologies included are exactly the kind you’d expect to find in a Logitech webcam – the best there are. You can find some more affordable alternatives here, but if you’re serious about streaming then the C920 is the most worthwhile investment. 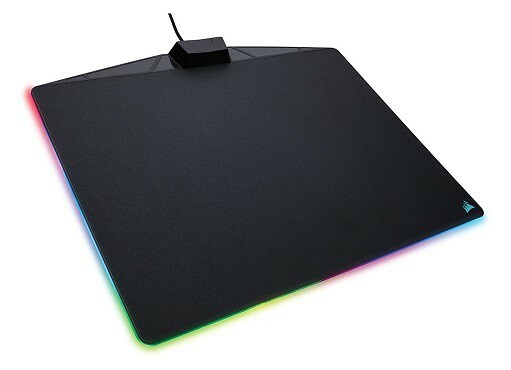 Finally, let’s finish off this guide with a bang – and by bang we mean the most vanity gaming accessory we’ve come across: the Corsair MM800 Polaris RGB Mouse Pad. It’s just what it sounds like – a mouse pad that lights up; perfectly in keeping with the RGB theme present throughout this build. It has some other cool features, like the firm rubber base and the low-friction micro-textured surface, but we’ve picked it almost entirely because of the lighting. And that’s pretty much that. All that’s left now is to purchase everything, hook it up properly and the keep it clean. If you need any help setting everything up, here’s a video that’ll help. Good luck and have fun gaming on the best PC that $1500 can buy.